Much of the increase in the deficit and debt is attributed to government spending outpacing revenue – both exacerbated by the recession and the government response to it – including hundreds of billions in bailouts and stimulus spending and tax cuts along with decreased tax revenues due to rising unemployment. 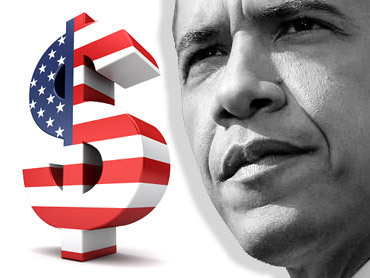 In recent days, President Obama has spoken of the need to bring the rising deficit and debt under control. "I intend to take serious steps to reduce America's long-term deficit – because debt-driven growth cannot fuel America's long-term prosperity," he said in remarks prepared for delivery to the leader's meeting last Sunday at the Asia Pacific Economic Cooperation summit. The National Debt has increased about $1.6 trillion on Mr. Obama's watch, though less than $4.9 trillion run up during the presidency of George W. Bush. But the White House budget review issued in August projects that by the end of the current fiscal year on Sept 30th, the National Debt could top $14 trillion. It gets worse. The same document projects that by the end of the decade, the National Debt will hit $24.5 trillion -- exceeding the Gross Domestic Product projected for 2019 of $22.8 trillion. The debt also costs a fortune to maintain. In the fiscal year just ended, the National Debt cost taxpayers over $383 billion. And that amount means the government is only paying 3.3 percent interest. If interest rates go up, so does the amount paid on the debt. And we're paying it to scores foreign countries which hold $3.5 trillion of the U.S. Debt. China leads the pack holding nearly $800 billion in U.S. Government securities, followed closely by Japan with $731 billion. Among the smaller nations lending the U.S. money are Luxembourg, Taiwan, Singapore and Ireland. Mr. Obama has said he hopes the health care plan pending in Congress will serve to curb the growth in the debt by reducing the amount government spends on health care. But it's a claim disputed by critics who say it will have the opposite effect.